That’s actually only just the beginning. Once you’re through those doors you’re snared. It’s coming up to Trick or Treat season now and the Dollar Stores are featuring lots of horror ‘equipment’ and dressing-up outfits. I slid surreptitiously into a store in the neighbouring town of Summerland yesterday and was immediately grabbed (not literally) by a set of glowing vampire teeth that looked a perfect fit. Witches hats too were flying off the shelves at $1.75 and $2 depending on the size of your head. Bargain. Filing around the packed shelves I spotted a high-powered water pistol – ideal for keeping those troublesome ducks, and anything much else really, off your back lawn and a battery-powered pencil sharpener that would sharpen two pencils simultaneously. ‘This is the biting edge of Dollar Store technology’ I murmured to myself in a self-satisfied way. The staff are wonderful too. 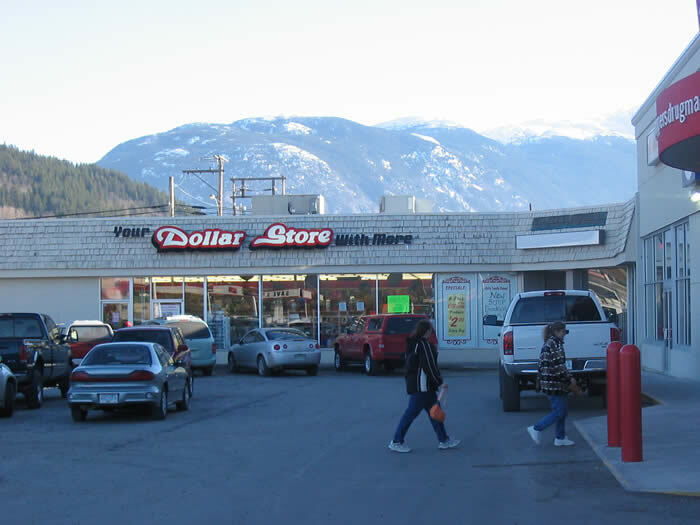 You can often catch up with whose husband has run away with whose wife in the neighbourhood because it’s being broadcast around the store quite loudly and uninhibitedly by two ladies charged with manning the ever-turning tills as they serve an eager Canadian public. One day this week I had taken a walk to a local second-hand book store in the area. One the way I dropped in at the Dollar Store where my partner’s dad came across me as I furtively rooted around the aisles for bargain Montreal Canadiens notepaper or some other extremely important purchase. ‘I knew where to find you’ quoth he without breaking stride. This should be a warning to me as my suitcase gathers more and more ‘useful’ low-priced stuff as the drip, drip effect of my Dollar Store spending stiffens the Canadian economy. Items have become so expensive now that there would probably not be a single item that one could buy for under a dollar. I do like the Reject Shop which sells good products but the packaging may have been damaged or other small little mistakes but the actual items are perfectly OK.
With the financial crisis I guess I will be shopping there more;). I have written a piece on the Wall Street fiasco! Peace to you:) & God bless. I’m not sure I could live on glowing Dracula teeth, Maple Leaf notepaper and cheap razor blades though! I finally found all your stories..and enjoying them so much..Well done Stu..Write a book…As for the dollar store..Who can live without browsing through..and we do have one of those really dollar dollar stores..Really great bargans..Cheers, boots. I will be in touch right as soon as I get my breath back here! Oh, how I can relate! I guess dollar store atmosphere is a global similiarity. I work at a dollar store in Pennsylvania, US, and it’s very similar. We have some really crazy things, and people come to the dollar store just to talk to the staff, other customers, etc. That’s interesting to hear. I’m now trying imagine the craziest thing you might have in the store!